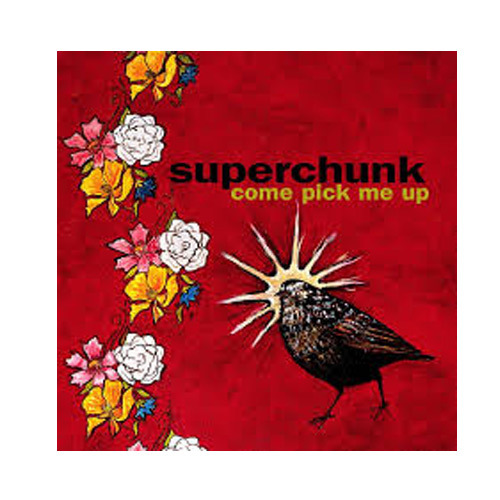 (Merge Records) First off for all of the people who claim that all Superchunk records sound the same (a sacrilege which will not get you on the good side of a guy who calls himself ‘superchunk sTEve), I have just one thing to say: HA. Nyah-Nyah Nyah-Nyah. All of you can now officially kiss my foolish, on the mouth, indoor living hinny, cause this is an entirely different kind of thing. I don’t think Superchunk has taken a left turn this sharp since “Foolish”. I remember bringing home “Here’s Where the Strings Come In”, popping it in, and loving it instantly, jumping around the room like a deranged Dickens character on Christmas morning, playing track six and seven again and again. That didn’t happen this time. I put it in and I liked it okay. There was something about it though, and it is Superchunk, so I listened to it about two more times, then went to bed. The next day at work, it started innocently enough with a tapping foot, and an ‘Ooo-Ooo-Ooo’ here and there. A week later, there was an incessant chorus running through my head, so much so that I kept turning around expecting to see Mac standing there with a guitar following me around. It’s been a couple of months now and I have to say, this thing has grown on me like pneumonia on an Eskimo. It is quickly climbing the sTEve charts, and I can’t stop singing these damn songs! Seriously, I need help. There is a lot going on on “Come Pick Me Up”. And, I will now go into depth on each one: Just kidding. They’re using a lot more clean and acoustic guitars, and a horn section, and I have to say that the songwriting style that usually seemed reserved for a Portastatic tune is in full force. There’s definitely a more mature feeling on this record. Sob-sob-sigh, Our little baby’s all growed up. Every new song is a unique experiment, with all of the original pop genius that we’ve come to expect intact. It’s New Improved Superchunk with special new flavoring! If you know somebody who dismissed them before, this would be a good time to give them a new listen. It’s the best album ever! (P.S. There is the minute possibility that this review might be just a tad tiny bit biased. –be good, superchunksTEve).